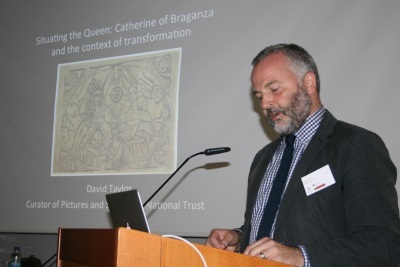 The title of the workshop was The Lasting Effects of Early Modern Cultural Encounters and the papers and discussions focused on three main topics: the way in which museums conserve and present the lives of queens consort in various formats; the extent to which these women then become part of national cultural memory; and the afterlives of cultural genres and objects relating to queens consort. The workshop began in the Livrustkammaren (the Swedish Royal Armoury), one of the museum partners of Marrying Cultures, where the group was welcomed by the Director Dr Malin Grundberg. A tour of the permanent exhibition was led by Ann Grönhammar and Sofia Nestor. They explained that the current display presents the great deeds of heroic Swedish kings such as Gustav Vasa, Gustavus Adolphus and Karl X Gustav. Naturally Queen Christina – a queen regnant - features in the exhibition but it does not focus much on queens consort. The curators want to rectify this in the new permanent exhibition to open in 2018, in which they will use the insights of Marrying Cultures relating to Swedish queens consort. 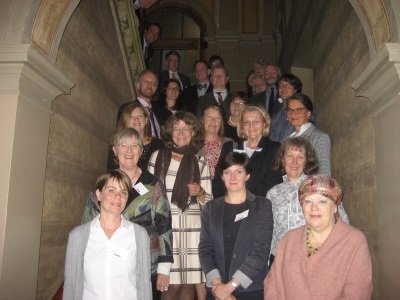 The workshop proper then began on 15 September at the Vitterhetsakademie (The Royal Swedish Academy of Letters, History, and Antiquities). 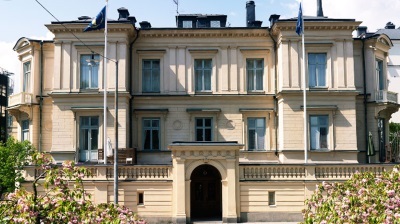 It was held there by kind permission of the General Secretary, Professor Birgitta Svenson, and the venue was particularly appropriate, as the Academy was founded by Luise Ulrike of Prussia, Queen of Sweden, in 1753 and her portrait looked down on the discussions over the next two days. After a welcome from Professor Svenson, Joanna Marschner (Senior Curator, Historic Royal Palaces, London) spoke briefly about the planning for the exhibition ‘Enlightened Princesses, Caroline, Augusta, Charlotte and the Shaping of the Modern World’ which she is organising with the Yale Center for British Art and which will be shown in New Haven and in London. These princesses are Caroline of Brandenburg-Ansbach, Augusta of Saxe-Gotha-Altenburg and Charlotte of Mecklenburg-Strelitz. They were the consorts of George II and George III, Kings of Great Britain and Ireland, and Frederick, Prince of Wales respectively. Over three hundred artefacts have been secured as loans for the exhibition in its two venues, and include material drawn from the national museums and the Royal Collection in the UK, and also from royal collections in Denmark and the Netherlands and from Germany. A book will be published by Yale University Press. The first seven papers of the day addressed exhibitions or museums presenting queens consort. Merit Laine (Curator at the National Museum, Stockholm), in a paper entitled: ‘Why Remember? Some Thoughts on the “Hedvig Eleonora Year” 2015’, reflected on the challenge of presenting Hedvig Eleonora, Duchess of Holstein-Gottorp, Queen of Sweden (1636-1715) to the general public. Married for six years to Karl X Gustav, King of Sweden, and a wealthy widow for fifty-five years, Merit Laine emphasised that her memory was overshadowed by the masculinity of the so-called Caroline Era, that is, the reigns of her husband, son and grandson. It was decided, therefore, to organise three exhibitions in three different palaces associated with Hedvig Eleonora, bringing the period alive with a different theme in each one. At Strömsholm Palace the focus was on horses and riding, at Drottningholm Palace it was on gardens and at Gripsholm Castle on textiles. The organisers aimed to appeal to all the senses, for instance, by including Baroque scents and music in the garden exhibition. Merit Laine emphasised two of the main challenges the curators encountered: first, modern interior design is no longer interested in including historical furniture or pictures but promotes a bare living space devoid of memory or of history; second, there are certain constraints associated with mounting exhibitions of collections in palaces owned and used by a reigning royal family. Julius Bryant (Keeper of Word and Image at the Victoria and Albert Museum, London) then asked: ‘Are Exhibitions or House Museums the best Way to preserve Memories? The Rival Posterities of King Georg II’s Wife and Mistress’. The two women concerned were Queen Caroline (Caroline of Brandenburg-Ansbach,1683-1737) and Henrietta Howard (1689-1767). They had met at Hanover, where Caroline has moved in 1705 when she married the future George II and where Henrietta arrived in 1714. Henrietta became George’s mistress and Lady of the Bedchamber to Caroline, but retired in 1734 from her role as royal mistress to the Palladian villa known as Marble Hill House which she had built by the Thames. There she was the patron of an intellectual circle which included Alexander Pope. Julius Bryant described how, when he became responsible for Marble Hill House, the house was empty and Mrs Howard largely forgotten, so he determined to bring her back to the house and set about tracking down furniture, paintings, japanned screens, books, etc. which revealed her taste and intellect. The outcome was his monograph Mrs Howard. A woman of reason. By contrast Queen Caroline as queen consort had a secure place in national cultural memory. Julius Bryant mentioned the Foucauldian notion that museums are power structures, imposing an interpretation on the viewer and exerting control via the wall labels that categorise the objects. He also pointed out that, because of the time it takes to design and mount a display, when it is unveiled it often presents a theoretical concept that was fashionable some years before. He cited the British Galleries at the V&A, devised in 1999 but opened in 2005, as following what he called an ‘economic’ model which presented the displays from the standpoint of patterns of consumption. The subsequent discussion asked whether a house museum suggests an authenticity that it cannot have, unlike a temporary exhibition which the visitor knows is a short-term construct. Alexandra von Schwerin, the chatelaine of Skarhult Castle, is the organiser of the successful exhibition: Den dolda kvinnomakten (Power in Disguise: Women at Skarhult Castle through Five Centuries). This presents five of her predecessors, one for each century from the sixteenth century to the present. She summed up her recipe for success as presenting a clear political message through the exhibition - in her case a feminist message about submerged women’s lives - and as providing journalists with simple and provocative ideas that they can get hold of. She stressed that the exhibition would not have worked without the historians who were her advisers and the scenographers who designed the five rooms. Her challenge was opening her own house, which had never been open to the public before and is not accessible by public transport. Nadja Bender, one of the organisers with Alfred Hagemann and Jürgen Luh, of ‘Frauensache. Wie Brandenburg Preußen wurde (Women’s Business. How Brandenburg Became Prussia)’, staged at Charlottenburg Palace in Berlin in 2015, talked about the ideas behind this exhibition. 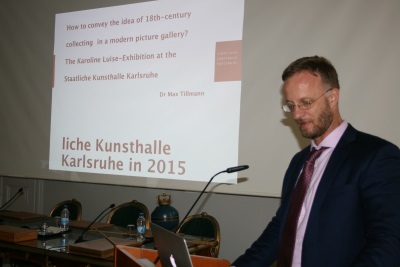 The organisers had presented their concept at the first Marrying Cultures Workshop in Wolfenbüttel in June 2013. The exhibition aimed to redress the balance of the male-dominated conventional Prussian history and introduce some of the important consorts. It first explained the dynastic marital system and the networks it brought into being and provided the visitor with a brief overview of Prussian history, before presenting the various roles a royal consort played during her life: as daughter and bride, wife and mother, queen and first lady, widow and regent, indicating the choices these women had to make - whether to conform or to distance themselves from their marital court, whether to follow duty or love, whether to espouse politics or art and in a few cases whether to become “an idol and an ideal”. Nadja Bender explained that the exhibition had been seen by 40,000 visitors over the three months it was open, but that to cover their costs, the organisers had been told their target was 50,000 visitors. The subsequent discussion asked how such exhibitions can impact on permanent collections and how these can be rejuvenated, perhaps by bringing works out from store and presenting them in a new way. The average museum label (e.g. at the V&A) is not allowed to be longer than fifty words, so the question is how to catch the interest of the viewer and make her or him stay longer to follow a theme. David Taylor (Curator of Pictures and Sculpture at the National Trust, UK) has the oversight of 17,000 oil paintings in over 300 properties. The National Trust displays whole houses with their contents. He focused on some of the portraits of Catherine of Braganza and the different representations of her on her arrival as foreign Portuguese princess, the portraits by Dirk Stoop, who came with her from Lisbon to England in 1662, and then her representation by Peter Lely, the king’s painter. It was pointed out in the discussion that her patronage of Italian art and Italian music was a statement of her identity and independence at the French-influenced court of her husband. Joanna Norman (Curator, Victoria and Albert Museum, London) spoke about her work on the recently opened permanent European Galleries at the V&A, which cover the period 1600-1815. This display presents 1100 objects relating to continental European as opposed to British art and design. The display was dictated by the V&A’s remit from its foundation to improve design in manufacture. She showed four objects to illustrate the kinds of work on display: the so-called Endymion Cabinet which came into the collection in 1850 without any provenance and may be associated with the French court and Anne of Austria; a silver casket from Alto Peru; a steel fireplace dating to 1800 made in the Armoury in Tula, Russia, and given by Princess Dashkova to Edwin Wilmot of Cork; and a Würzburg writing cabinet. She spoke about the different ways of presenting objects in an engaging manner, for instance by demonstrating their function (a linen cupboard with hanging sheets, for instance). She also mentioned the way the exhibition charts the development of taste throughout the period. The Heritage Lottery Fund of Great Britain, which had given substantial funding to the display, wanted it to think beyond western Europe and to present Europe in the context of the world as a whole. Families were also a major focus and technology was used in a number of interactive displays and in the website. The last two papers of the day addressed questions of consorts and texts. 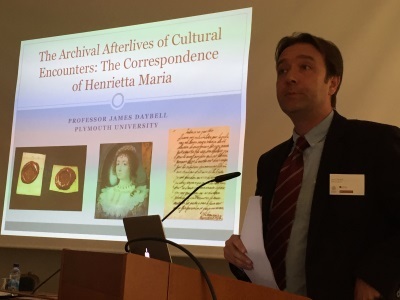 James Daybell (Plymouth University) gave a paper entitled: The Archival Afterlives of Cultural Encounters: The Correspondence of Henrietta Maria (Queen of Britain). He mentioned that there is a modern edition of her letters, though not a historical critical edition and distinguished between what he called the ‘letterness’ of letters - i.e. their immediate function in communicating with the addressee - versus the afterlives of letters, when they are read later in different contexts. He also discussed preserving documents as cultural assets, for instance, in the letter book in the Bodleian Library in Oxford of about 80 leaves containing about 15 holograph letters by Henrietta Maria to Charles I, including one from her to him on their wedding day. Here the personal and the private are filed together with the public and the state. In contrast to these intimate letters, the printed collection from 1645: The King’s Cabinet Opened, or Certain Packets of Secret Letters & Papers Written with the King’s Own Hand. Printed letters captured at the Battle of Naseby by Sir Thomas Fairfax was conceived as a polemic against Henrietta Maria. Jill Bepler (Herzog August Bibliothek, Wolfenbüttel) spoke about ‘Tracing Books and their Movements: Dynastic Women and Cultural Transfer in Early Modern Europe’. Her focus was on the use of devotional books in a political context. She pointed to the differing uses of books in the self-fashioning of the consort in portraiture of the 16th and 17th centuries, where the emphasis was on confessional probity and intensive reading, and in the eighteenth century, when this ideal was replaced by the enlightened Princess and extensive, effortless reading for personal improvement and conversation. She discussed the use of inventories as sources for reconstructing female books ownership and patterns of female inheritance that led to the dispersal of women’s chamber libraries, in contrast to the relative stability of the male dynastic library handed down over generations. She discussed the marriage in 1577 of Sophie Hedwig, the daughter of Duke Julius of Braunschweig-Lüneburg, to Ernst Ludwig of Pommern-Wolgast and how the young princess was given a chest of richly bound Lutheran works to take with her to Pomerania, where she was expected to support the confessional stance of her birth dynasty, reminding us of barely perceptible but highly political confessional borders crossed by young brides, even those whose husbands were ostensibly of the same confession. Looking at the marriage between a Lutheran and a Calvinist that took place in 1667 when Christian (V) of Denmark married Charlotte Amalie of Hessen-Kassel (1650-1714) she discussed a later example of the use of books as a confessional arsenal. At a time when she was struggling against Lutheran attacks on her right to worship according to reformed ritual in Copenhagen, Charlotte Amalie inherited the complete book collection of religious and political texts belonging to her mother, Hedwig Sophie, Landgravine of Hessen-Kassel née Princess of Brandenburg (1623-1683), whose court was a centre of Calvinist devotional book production and translation. Charlotte Amalie went on to found the first Reformed Church in Copenhagen. That evening the conference participants enjoyed the hospitality of the Vitterhetsakademie at dinner. Friday, 16 September began with a paper by Eva-Lena Karlsson (Gripsholm Castle) on ‘Queens in the National Portrait Gallery’. She explained how the Gripsholm collection has its origins in the dynastic portrait gallery or Ahnengalerie of the Swedish kings, in contrast, for instance, to the British National Portrait Gallery in London founded in 1856. As her main example, she discussed Hedvig Eleonora’s collections of portraits of her own German relatives, their iconography and reception. Elise Dermineur (Swedish Collegium for Advanced Study and Umeå University) spoke on the topic of her forthcoming monograph to be published in 2017 by Routledge: Luise Ulrike and her Political Legacy. She stressed that, while Luise Ulrike’s visible cultural legacy is relatively well known today, what is often ignored is the extent to which she was an active political agent. Elise Dermineur asked how we can assess her political legacy and how we can distinguish mere activity from actual legacy. She emphasised that Luise Ulrike was a political catalyst, an instrument and an agent. She wanted to increase royal prerogatives, though her attempt at a coup failed. At the same time, her brother, Frederick II, King in Prussia, used her as an unofficial diplomat and lobbyist. Maureen Meikle (LeedsTrinity University) spoke about Anna of Denmark (1574-1617), Queen of Scotland and later Queen of England. She had grown up in Germany and Denmark and married James VI of Scotland in 1589 at the age of 14. James and Anna began their married life in Kronborg, arriving in Scotland in May 1590. Anna was interested in theatre (e.g. the well-known court masques of Ben Jonson and Inigo Jones performed between 1604 and 1611), was a lutenist and played the lyra viol and the virginals and learned Italian from John Florio who dedicated his dictionary to her. On her death in 1619 she had an extensive art collection at Greenwich, Denmark House and Oatlands. Her most lasting legacy, apart from the masque texts by Ben Jonson, is the architecture she commissioned from William Schaw and Inigo Jones. Inigo Jones built Denmark House (now Somerset House) and the Queen’s House at Greenwich, though she did not live to see the latter completed. Barbara Przybyszewska-Jarmińska (Polish Academy of Sciences, Warsaw) spoke about ‘Musicians at the courts of the King of Poland from the Vasa Dynasty both then and today’. In 1587 the Swedish king Sigismund III Vasa was elected king of Poland and Grandduke of Lithuania. He had been brought up as a Catholic in Sweden and married Anna of Habsburg (Duchess of Inner Austria) in 1592. She had grown up at the Munich court where Orlando di Lasso was the kapellmeister. Sigismund wanted musicians from Rome, not Venice as the Habsburgs did, and in 1595 a group of Roman musicians arrived in Cracow, led by Luca Marenzio. There was then an unbroken succession of Roman kapellmeister in Cracow for the next fifty years: Giulio Cesare Gabussi from 1601, Asprilio Pacelli from 1602 to 1623, Giovanni Francesco Anerio from 1624 to about 1630 and Marco Scacchi from 1632 to about 1649 or 1650. This cultural transfer was forgotten for centuries because Polish historiography claimed that Polish culture had exclusively Slav roots. From the 1980s on and thanks to the efforts of the speaker herself, the Italian musical heritage has been uncovered. Alas, it is now in danger of again being obliterated by nationalistic considerations. In her paper ‘The fashion Legacy of Eleonora di Toledo from Renaissance Portraiture to Alta Moda’, Ewa Kociszewska (University of Oxford) discussed the famous portrait of Eleonore de Toledo (1522-62) by Agnolo Bronzino painted in 1544-5. She explained who the sitter was and the circumstances of her marriage to Cosimo I de’ Medici and she presented what is known about the making of the dress that Eleonore is wearing in the portrait. She then demonstrated how influential this garment has been on Italian and international haute couture, an excellent example of a lasting cultural encounter. She finished with the recreation of the dress by Isabelle de Borchgrave, which, coincidentally, was on show at that very moment in the Livrustkammaren in an exhibition opened the day before! Finally Helen Watanabe-O’Kelly presented what for her were the research results of the three years of ‘Marrying Cultures’ in a paper called ‘Dynasty, Consortship and Cultural Transfer: Some Conclusions’. She began by saying that the goal of the project had been to investigate the role of the consort within the system of dynastic marriage and to find out to what extent she was a vehicle for cultural transfer between European territories over a period of about three hundred years. Poland and Sweden had been deliberately chosen together the German-speaking world and Britain in order to challenge the often Romano-centric view of court culture focused on Italy and France. A major aim was to see beneath and beyond the modern map of Europe with its nation states and fixed borders in order to arrive at an earlier perception of Europe in which, at the level of elite culture, the linguistic, cultural and political borders were porous and different national cultures were entangled. The three concepts - dynasty, consortship and cultural transfer – provided the parameters for the project and the research undertaken led us to reassess them. Dynasties are familial groupings based on descent from a common ancestor and this line has to be carried on in order to pass land, wealth and power down through the family. Most of the dynasties the project examined adhered to the principle of patrilinear primogeniture, that is, the succession of the eldest son to the throne and title or, failing a son, the closest male relative. Queens consort were necessary instruments in this system, since women were necessary to produce heirs. Consorts, however, had a dual allegiance – to their natal dynasty and to their marital dynasty, which often led to conflicting loyalties. Royal and aristocratic women were also often the memory of the dynasty, preserving and publishing genealogical knowledge. In Poland, by contrast, we had the example of an elective monarchy. The Poles, however, did still have seven Jagiellonian kings elected in succession and the dynasty was important in passing property through inheritance between siblings and their descendants. However, under an elective monarchy the principal duty of the consort in all other territories – to produce the next king – was not urgent in the same way. Britain was another exception to the rule of patrilinear primogeniture. Since it did not abide by the Salic Law, women could and did become monarchs. Nor did Sweden have a simple transition of power from father to son during our period. So dynasties could evolve or be supplanted by others, as the need arose, and this had consequences for the consort who had to adapt to circumstances not of her making. How were consorts chosen? Political considerations were always paramount, since a royal marriage was an alliance not just between two families but between two territories. Wealth was also a factor and another was the bridegroom’s desire to extend his territory. However, no matter how wealthy or how much territory she could command, once mainland Europe had been split after the Reformation into the three confessional blocs, Catholic, Lutheran and Reformed, marriage alliances usually had to be made within the boundaries of whichever confessional bloc a dynasty belonged to. What made for successful consortship, since this was necessary precondition for a queen to exert cultural influence? The first criterion is successful biological performance. Providing her husband with legitimate offspring was the pivotal function within the dynastic system that gave the queen consort her importance and this was true even in an elective monarchy. At her marriage, the consort gave her body to her marital dynasty to serve its needs. However, the dynastic system often united marriage partners unable to procreate. They might be too young, for instance, or sometimes even too old. Another factor that could impede the consort in carrying out her biological mission was the inability or unwillingness of her spouse to consummate the marriage or to engage in regular sexual relations with her. Consorts who were not fruitful were censored for failing to ‘do their duty’. Whether a consort produced a son or not was the most important factor in determining whether she had any standing at her marital court and therefore whether she could exert political and/or cultural influence. The consort was usually only allowed to attend her husband’s meetings with his ministers, for instance, after she had given birth to a son. A childless consort was a nobody and a failure, a consort who had merely given birth to daughters only slightly better. The consort could usually only legitimately exercise political authority when she was appointed regent on the death of her husband and during the minority of her son or else during her husband’s absence abroad, visiting another territory or on military campaign. Even then she usually had a regency council to guide her and sometimes too a male co-regent at her side, but it was often as a widow that a consort came into her own both politically and culturally. A consort could, however, exert considerable influence if she could successfully negotiate certain key relationships. The most important of these was that with her husband. She will have absorbed with her mother’s milk the ‘job description’ for this relationship, based on the division of labour between monarch and consort. The monarch was responsible for war and government, the consort for religion and charitable deeds. He was expected to be a model of courage and fortitude, she of charity and piety. He could philander, she had to be chastity personified. He built fortresses, she founded convents. He conquered territories by force of arms, she connected them by brokering marriage alliances and by using her dynastic networks. He had to be loved and feared by his people, she had to demonstrate love for them. He needed to look well on a horse, she had to impress in the ballroom with her fashion sense and magnificent jewels. Though both could collaborate in commissioning buildings, portraits and operas, he rode in tournaments, she danced in ballets. In this way, her sphere of influence and of action were delimited from the beginning. How this worked out in practice varied greatly and a consort could exercise considerable political influence behind the scenes. When considering powerful figures at court who could make life difficult for a consort and push her to the sidelines, the mistress first comes to mind. The danger was not, however, that a king would find an attractive woman for a sexual relationship but that he would find his mistress a more congenial companion and confidante than his wife. An often underestimated competitor for the consort was her mother-in-law, especially if that mother-in-law had been the regent for her son and was used to ruling the roost. The consort also had to avoid too overtly foreign an appearance. She was chosen because she came from another territory, because she was a foreigner, but once she arrived at her marital court, the consort’s new dynasty wanted her to become absorbed into it as quickly as possible and they therefore often distanced her from her own culture. She was expected to integrate herself visibly and fully and it was fatal for her chances of success in her new environment if she were constantly seen to be ‘foreign’. The consort’s own family, on the other hand, expected, indeed often demanded, that she further its interests at her marital court, so they therefore wished her to bear in mind at all times the dynasty and the culture into which she had been born. Whether the consort was regarded as too foreign or not, depended on a number of factors, chief among them language. A consort who could not communicate with her new courtiers and subjects in their language could not integrate well into her new environment. However, the consort’s sense of self and of self-importance depended on her holding fast to her own dynastic origins, while at the same time absorbing the culture of her new home. The consort had to find her feet at her marital court in a society tightly controlled by ceremonial. To transgress against such rules, even out of ignorance, made the consort the target of gossip and criticism which, because she was under constant observation, immediately did the rounds of the court and were reported to her own family by her physician and her confessor, to foreign courts by the ambassadors and were published in newspapers, broadsheets, and lampoons. Fundamental to our project is an understanding of culture as encompassing a wide spectrum of social practices from food and dress through ceremonial and religious practices to architecture and art, music and literature; as constantly evolving; and as remaining alive and vibrant through transfer from outside. Also fundamental is the notion that transfer is an on-going process, not a finite event, and that cultural transfer takes place in both directions, because the cultures involved become ‘entangled’. Three further factors influence cultural transfer between courts: 1. court culture is inherently political; 2. court culture is to some extent transnational culture; 3. objects at court have a particular potency. The modern boundary between ‘politics’ and ‘culture’ is anachronistic, based on a distinction between the public and the private sphere that was only beginning to emerge in the middle of the eighteenth century. Like the other members of the court, a consort was a public figure, whose every action related to the unique and visible role she played in the polity and at court. Cultural transfer between courts is different from other cases of transfer, for instance between coloniser and colonised, because the two partners in the exchange were equal and symmetrical. Another feature of court culture is that it conformed to an international standard and did so increasingly over the period 1500-1800. Courts everywhere universally admired and sought to import Italian culture throughout the sixteenth and much of the seventeenth century, while, by the mid-eighteenth century, the influence of France was so pervasive that to a certain extent the court had become a transnational space. By that date most persons of royal and princely blood wrote and spoke to each other in French, danced French dances and wore French fashions, while the operas they attended were by German composers with libretti in Italian. In earlier centuries it was far more likely that a consort would bring a distinctively foreign culture with her from her natal court – an outstanding example being the arrival in Poland-Lithuania of Bona Sforza in 1518 as the second wife of Zygmunt the Old, which led to the direct importation of Italian culture on every level from learning to architecture to foodstuffs. What should also be remembered is that, once two dynasties became connected or entangled, they remained so forever, unless, that is, war or a confessional dispute created a rift. All the members of both dynasties remembered from then on that they were connected and that members of one dynasty had a claim on the members of another. The newly-wedded consort then often went to a foreign court where there might be books in her own language and people who spoke it and where portraits of her relatives adorned the walls. This leads us to the extraordinary importance and potency of objects in court culture. Objects represented for a consort portable proof of her identity and were usually the only elements of her home culture that she was allowed to keep. Personnel from home was sent back, the objects she brought with her were not. Then there was the presentation of what Maureen Cassidy-Geiger has called ‘objects of national identity’ as diplomatic gifts – amber from Brandenburg, Meissen porcelain from Saxony. Nor should we forget how essential collecting was to the cultural life and prestige of a court. It was important for the prestige of a prince to have, at the very least, a library, a cabinet of curiosities, a jewel house or treasury and a portrait gallery. Many consorts had their own versions of these collections, often amassed with great knowledge and perseverance and carefully ordered. As well as importing objects which were then copied or emulated, a newly-wedded queen consort could bring a cultural innovation from home which effected an immediate and permanent change in her new territory. A striking example of this is the introduction of Italian opera and ballet to the imperial court in Vienna by Eleonora Gonzaga I (1598-1655). A consort was not the only person who moved from one territory to another on the occasion of a royal marriage. The negotiations before the marriage involved diplomats going to and fro and, after the marriage, ambassadors from each territory that was party to the marriage were established in the other’s capital city. Diplomats shipped objects, books and foodstuffs back home, as did the musicians, artists and actors who went to and fro, taking scores, paintings and texts in both directions. Most numerous of all were the merchants, seeking out knowledge of what goods from their home territory they could sell in a foreign city and what goods they could bring back on the return journey. Finally, we have seen over the course of the project the extent to which all consorts created their own physical spaces which the same time were cultural spaces: palaces, gardens, libraries, convents or chapels. They express the consorts’ personality and identity and at the same time provide them with a refuge. The political and cultural role that queens consort played in territories as diverse as Poland, Sweden, Britain, Naples, Spain, Brandenburg, Austria and Prussia from the sixteenth to the eighteenth centuries was influenced by the very nature of the dynastic system and the cultural specificities of court culture. No matter how diverse the personalities of individual consorts or of the territories they married into, these factors crucially determined whether their role at their new court in any sphere was that of an active agent, an instrument in the hands of others or someone whose presence made them a catalyst for developments of which they were sometimes not even aware.